But I think we can do even better. I'm going to do a few quick blog posts about various improvements I believe would make it a "world class" (who doesn't want to be world class?) protected bike lane. The first is intersections. The majority of injuries happen at intersections. 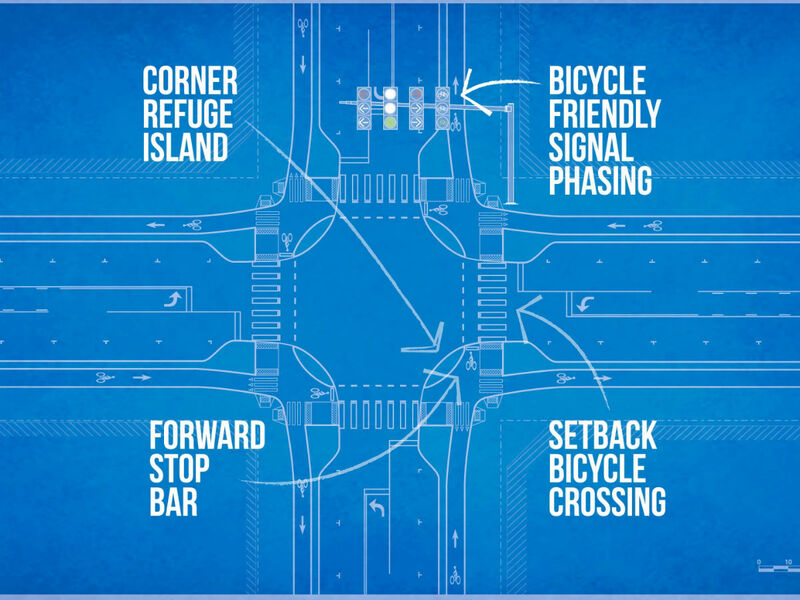 We need to fix the intersection, not just mid-block. 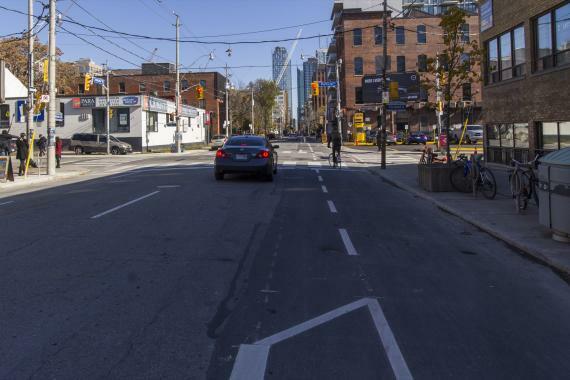 According to the City of Toronto's own study, the majority of injuries happen at intersections, driveways and laneways, and most of those involved motor vehicles turning. 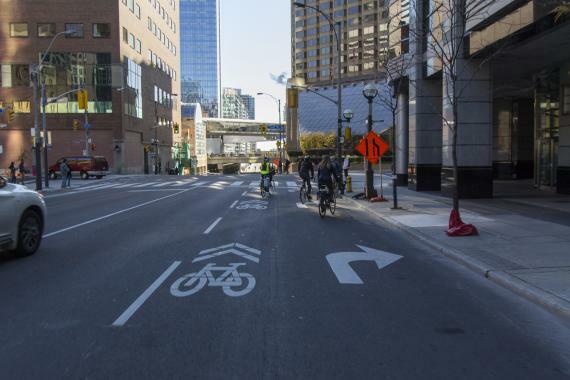 Yet, we can see from the following image of the cycle tracks on Adelaide and Richmond, they disappear as we approach the intersection and then it's just business as usual. 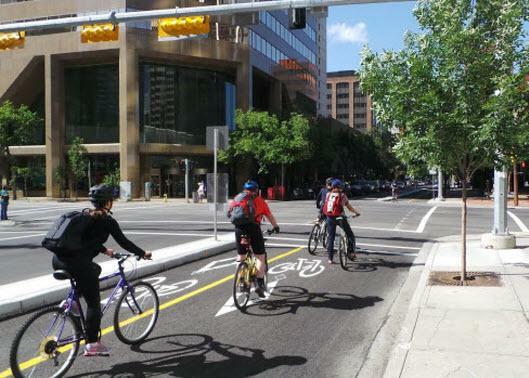 I would assume that we would see little reduction in intersection collisions (there might be some lowered risk of a collision because the hordes of cyclists on them raises the awareness of drivers). As with most intersections in this city, a lack of infrastructure at the intersection creates confusion about the right of way. Is it the driver on the left who wants to turn right or the cyclist on the right? It's also difficult for drivers to move to the curb because there lots of blind spots while shoulder checking. People are even more uncomfortable at intersections where there's a right-turning lane such as on Simcoe north of Front, and on Richmond east of Bathurst. At these spots the City is forcing cyclists and drivers to switch places on the fly and it all looks like chaos as drivers arrive at speed and some cyclists stick to the sharrows that show them where to cross and others stick to the curb where they feel safest. 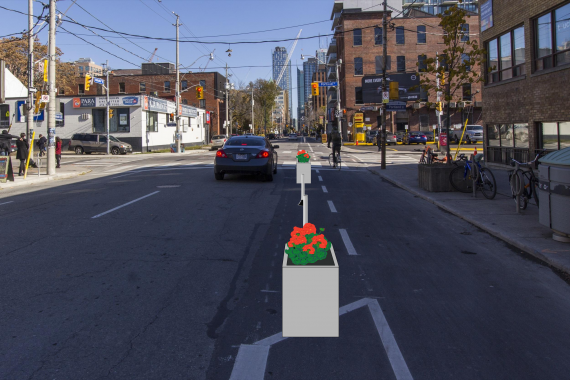 The planters would provide a strong visual cue to the separation and will slow down car traffic by changing the character of the street from being a thoroughfare to a slower street. 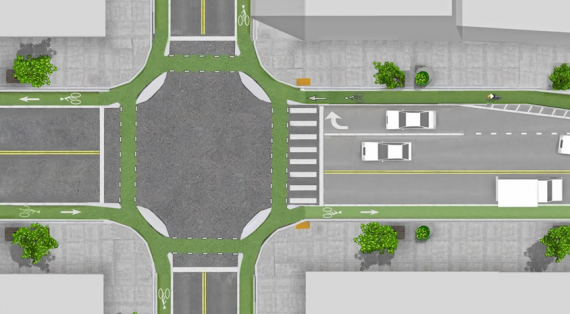 A collection of design elements makes left turns simple and secure, right turns protected and fast, and provides straight through movements that minimize or eliminate conflicts from turning cars. With this design, riders will never feel stranded, exposed, or unsure of where to go and how to get there. 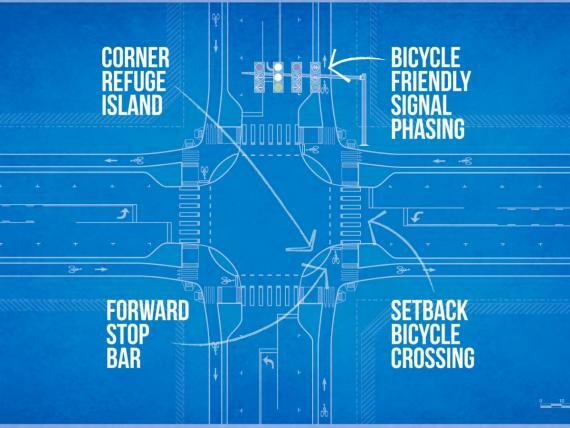 There are some challenges with the current regulatory framework and engineering standards, but we hope that the City can adapt the key elements to Toronto's situation: "refuge islands" at the corners, forward stop-bar, bicycle-friendly traffic signals, and setback crosswalks and bicycle crossing. If it can be done on the small streets in the Netherlands it can be done here with enough political will to reduce cycling injuries. If you like this idea too, please send your comments to Jason Diceman, the guy in charge of public consultation for this project. Next, I will talk about the poor connections to the protected bike lanes from the west.